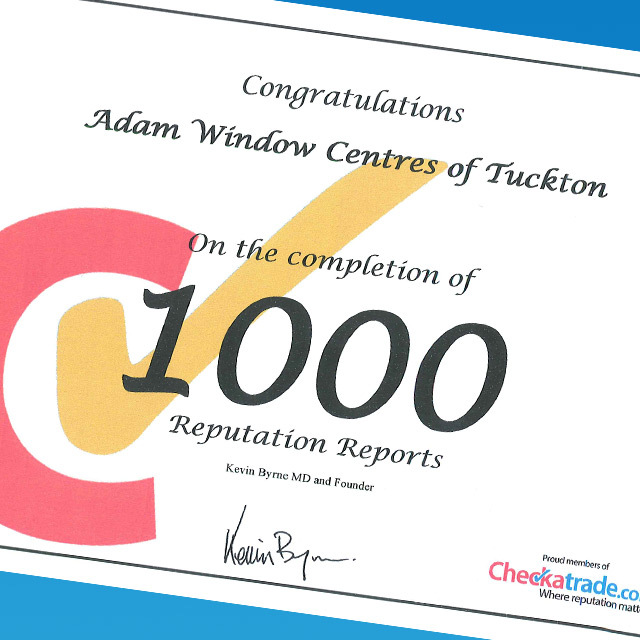 “We have been a proud member of Checkatrade since 2011 and we are very proud to have received this certificate celebrating one thousand customer reviews. Our thousandth review came from a happy customer in Bournemouth who commented “A pleasure to do business first class work.” for their installation of a new door and replacement windows, marked 10/10 on all four categories. Rated on Reliability & Timekeeping, Tidiness, Courtesy and Workmanship we have received a fantastic overall score from our customers of 9.72. To see more of our customer feedback, click here and visit our Checkatrade page. Congratulations! You will be pleased to know that your 1000th Reputation Report Card has now done live on the system. This is truly a significant achievement of which you should be really proud. We have enclosed a certificate, which we hope you will show to your potential customers to help win even more work. I would like to take this opportunity to acknowledge you as a highly valued member. I really appreciate you using Checkatrade to promote yourself as a good, honest trader and I trust the rewards for you have been beneficial.